Beauty & All That: Don't forget to... Pack A Hat! Don't forget to... Pack A Hat! This summer, whether you're going to the beach, outdoor BBQ or a picnic in the park, protect yourself from the UV rays with Pack A Hat from Cappelli Straworld! 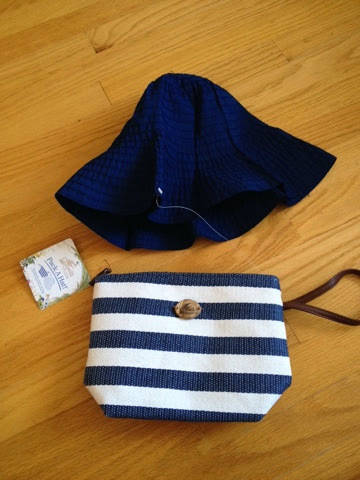 This adorable clutch, shown in Navy Blue & White, will carry your essentials- keys, cards, lip gloss- and even a sun hat! This cute floppy and wearable hat will give you UPF 50 protection needed for your skin and peepers too (but I like to wear shades just in case) for those sunny days! It's so easy to forget to bring a hat and one that is so portable and easy to remember is a WIN for me! The hat is durable like the ones I already have from -- but once folded, it was like it vanished inside the clutch. The roomy clutch can also be thrown into your summer beach bag! Check out www.hartfordyork.com/product/7341/womens-hats-ss to order yours today! They're only $25 for the hat and clutch combo and comes in many colors and also stripe combos!